The ECG feature on the Apple Watch Series 4 gets the lion’s share of headlines about potentially life-saving incidents. However, it’s the wearable’s fall-detecting ability which is the hero of the latest story of this kind. In Munich, Germany, an 80-year-old woman fell in her apartment. Fortunately, her Apple Watch recognized what had happened and called emergency services. This isn’t the only similar story of this kind that we’ve heard. Earlier this year, a 67-year-old man in Norway was home alone when he fainted and suffered a hard fall in his bathroom. Luckily, he was wearing an Apple Watch Series 4, which alerted first responders. Fall detection was introduced as a feature with last year’s Apple Watch Series 4. It uses data from your device’s accelerometer and gyroscope to identify when users have suffered a fall. When an incident like this happens, the Apple Watch will then initiate a call to emergency services. If the user is unresponsive after 60 seconds, the emergency call is placed automatically. Your emergency contacts will also be notified and sent your location. For anyone with elderly relatives, this could be a massive game-changer. It’s the kind of technology which truly justifies owning an Apple Watch. Check out Apple’s video about the feature below. Samsung has revealed the new Galaxy A Series, designed with incredible improvements to the essential device features.This includes immersive viewing experiences, longer lasting performance and ground-breaking cameras. The new phones include Samsung Galaxy A70, A50, A30, A20 and A10. To the Managing Director at Samsung Electronics West Africa, David Suh, the firm is committed to providing meaningful innovation to everyone for a better mobile experience, which starts with the all new Galaxy A Series. “People are changing the way they connect, and their smartphones need to keep up. Our new Galaxy A Series offers improvements to the essential features that will support these live interactions, with diverse options to meet their ever-changing needs,” he added. With the Galaxy A Series, consumers can also seamlessly experience the Galaxy ecosystem using key services such as Samsung Health, Samsung Members, and Bixby. The all-new Galaxy A Series is filled with enhanced features across the range. Samsung has unveiled a folding phone that doubles as a tablet, which the Korean company hailed as the biggest development in smartphones in a decade. 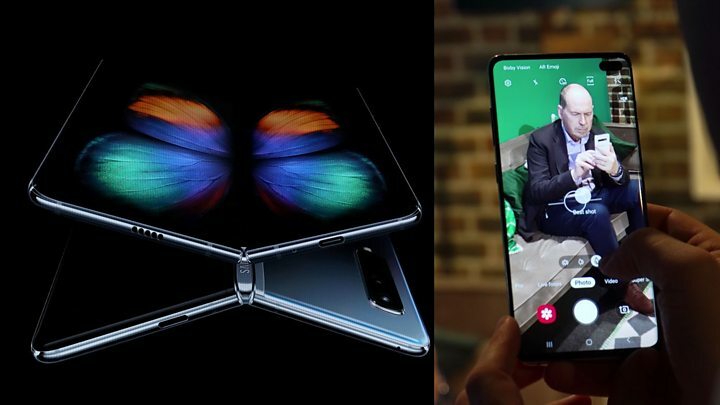 The Samsung Galaxy Fold, which was launched alongside four other smartphones on Wednesday evening, functions as a typical smartphone but can be unfolded to a second 7.3-inch touchscreen. The device, which will be released in April, will cost at least $1,980 (£1,516), making it by far the most expensive smartphone on the market. Samsung also unveiled the latest version of its flagship smartphone line, the Galaxy S10, releasing three models that cost between £669 and £1,099. The phones – the cheaper S10E, the S10 and the S10+, feature a fingerprint scanner embedded within the touchscreen and three rear cameras that allow for wider-angle photos. The smartphone-maker also teased its largest phone yet, the S10 5G, which offers 6.7 inch display and promises to be the future of smartphone connectivity. The phone will be available later this year, when 5G networks, that offer faster mobile data connections, come online. The company is hoping 5G support will give it a leg up over Apple, which is not expected to unveil a 5G phone until next year. All these devices are capable of wirelessly charging other Samsung phones and accessories. Phone makers have spent years attempting to develop flexible touchscreens that allow devices to fold in two, answering consumers’ demands for ever-bigger phone screens, without sacrificing portability. Several manufacturers are now working on their own foldable phones, hoping the technology will breathe life into a saturated smartphone market. Samsung said folding the phone out into a bigger-screened version will allow multi-tasking features such as split-screen apps and better video watching. However, the high price of the device means it is likely to sell in small numbers. Some versions are likely to sell for more than $2,000, just 18 months after Apple introduced the first $1,000 17 months ago. The presentations are winding down, and Samsung has left us with their vision of the future in their latest commercial featuring the classic song made famous by Doris Day. But there’s more to come, keep up to date with the latest Samsung news here and follow @JamesTitcomb on the ground as he elbows everyone out of the way for a first look at the folding phone. The Galaxy S10 5G is being introduced with a fanfare – a 6.7 inch display that promises to be the future of smartphone connectivity. This is the biggest screen on a Galaxy device. It comes with a 25-watt charger, so it will charge a lot faster. It has a 3D depth-sensing camera. Verizon customers will be the first to receive the handsets. Samsung’s new Galaxy watch features a battery that lasts up to a week and can continually analyse your stages of sleep – this is a huge part of the company’s push into healthcare. They include heart monitors and “continuous stress tracking when life gets overwhelming”. Samsung has just launched wireless, Apple-style earbuds. Hot take from the Samsung stage: “They are so cool”. They feature a high efficiency chip set for which allows for 5 hours of calls on a single charge. They are also Bixby-enabled, so you can interact with them remotely and give them instructions (and why wouldn’t you?). They will be available from March. Incidentally, Bixby can now apparently tell the difference between the Queen’s English and English from Queens (cue laughter from stage). Samsung’s AI assistant also understand three different languages. The Samsung Galaxy S10 will start at £799, up to £999. The S10 Plus will start at £899 with a £1,099 version. The S10E will begin at £669. You can find pre-order details on the Samsung Galaxy S10 here. The S10 presentation featured Instagram chief executive Adam Mosseri, who presented an “Instagram mode” that will allow users to quickly post any photo onto the social media site. Of course, there was a rather awkward selfie on stage with DJ Koh…. Matt Field has gone through all of the bells and whistles of the new phones here – here are the highlights and how they differ from the S9. The S10 introduction has come hot on the heels of the Samsung Galaxy Fold. But what does it bring to the table? Read Matthew Field’s guide to the new devices to find out more. “Samsung just announced the price of the fold – $1,980 and up – and the crowd here literally went ‘ooooooooh'” like a pantomime,” says James Titcomb. DJ Koh Samsung presents the Galaxy Fold. “Today marks a new beginning, a shift. The new device will cost $1,980 (£1,516) and will be available from April 26. The new Galaxy Fold has a 9nm processor and 12GB of RAM, making it one of the most powerful smartphones on the market (and ever). It has 512GB of on board memory. Because the phone folds up like a tablet from essentially two “smartphone” bodies, it has a dual battery, one in each side of the device that link together. Samsung has claimed that the Galaxy Fold will fit in the palm of the hand when it’s folded. It’s here – within a couple of minutes of the launch, we’ve seen the first official photo of the foldable phone. The first official description is “It’s gorgeous”. Samsung has called the new device part of a “whole new category” and confirmed the name: Samsung Galaxy Fold – with a 7.3-inch folding infinity display that folds the phone out into a tablet. Samsung says it has invented a whole new hinge system with “multiple interlocking gears” that are hidden away. We’ve been stuck in a camera race, Peter Jarich of analyst firm GSMA Intelligence argues, as smartphone makers have struggled to stand out with a “series of black rectangles”. Could Samsung launch the iPhone killer? Samsung’s launch today could provide the smartphone market with a much-needed jolt this year. In January, Samsung was forced to issue a profit warning as sales fell 11pc and profits dropped dropped 29pc on the back of slowing phone and chip sales; just days after Apple chopped its sales forecast due to an economic slowdown. James Ticomb (@jamestitcomb) is up and running from the launch in San Francisco. First thoughts? Rumours ahead of the launch included a foldable phone, nicknamed Samsung Galaxy X or Galaxy F (for fold), which was teased back in November. It would be a first for the technology company and could be a game-changer in the smartphone market. But that’s not all. Several rivals are rumoured to be launching 5G smartphones at Mobile World Congress next month, which could prompt Samsung to release a rival product today. Samsung’s main new phone tonight is expected to be the Samsung Galaxy S10. It is due to feature some “very significant” design changes, according to Samsung’s mobile chief executive DJ Koh. You can read all the rumours here – but we’re expecting more cameras, more memory and a larger display.